The first inversion of a chord is the voicing of a triad, seventh chord, or ninth chord with the third of the chord in the bass and the root a sixth above it. 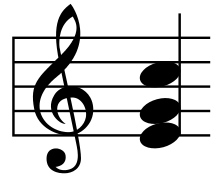 In the first inversion of a C-major triad Play , the bass is E—the third of the triad—with the fifth and the root stacked above it (the root now shifted an octave higher), forming the intervals of a third and a sixth above the inverted bass of E, respectively. Root position, first inversion, and second inversion C major chords Play root position C major chord , Play first inversion C major chord , or Play second inversion C major chord . Chord roots (all the same) in red. Third inversion F7 chord Play . ↑ Walter Piston, Harmony, fifth edition, revised and expanded by Mark DeVoto (New York: W. W. Norton, 1987): p. 66. ISBN 978-0-393-95480-7.